There are many easy changes you can make. You may not realize it, but your laundry room is a great place to reduce your environmental footprint. Depending on your current habits, you may be able to make a few changes that will reduce the trash you create, the water, petroleum, and electricity you use, AND the toxins you release into your local watershed. Who knew you could make such a difference in one room! The first thing to check is that you are using a high efficiency energy star washer and dryer. Energy Star appliances use advanced technology that can use anywhere from 10 to 50% less energy than a traditional washer and dryer. If you don’t already have one, go to www.energystar.gov/ to look at models, then go to your local appliance store to purchase one. Since heating the water accounts for 90% of the energy that your washer uses, choose the ‘cold’ water option and cut your electricity usage with each load. Most plant based laundry detergents (more on these later) are formulated to work well in cold water, so if this is not your current practice, give it a try and see if you notice any difference in how clean your clothes get. Also remember to only wash with a full load of clothes. Energy Star estimates that families will save 3400 gallons of water a year when they do this. Go grab your laundry detergent and bleach. Read through the ingredients closely. Check for petroleum and water in your detergent and for chlorine in your bleach. An easy change is to purchase a plant based detergent such as one from Seventh Generation or Ecover. By using this type of detergent you are taking a small step to reduce our dependence on oil. Every step is an important one! Both Seventh Generation and Ecover can be found in local grocery stores or they can be purchased online. You should buy the highly concentrated versions so you will get more out of each bottle. And then remember to throw the bottle in your recycling bin when it is empty. When choosing a bleach product, you should pick one that is oxygen or hydro based. Chlorine is toxic to marine life and creates a by-product called dioxin which is a known carcinogean. It is a bit harder to find oxygen or hydro based bleaches from Ecover or Earth Friendly Products in your grocery store, but they are sold at Target and can be purchased online. Another option is to purchase a dry laundry detergent which will eliminate the water in each bottle you use annually. Water typically makes up 80% of a laundry detergent. Often these products are sold in paper containers which can be broken down flat and therefore take up less space in your recycling bin. We are investigating if it is environmentally better to use a recycled plastic or paper container. When we get a definitive answer we will update this article. A final recommended change is to purchase a laundry ball which can be reused for over 1000 loads. Instead of using a detergent, just toss a laundry ball in your wash load and get the same cleaning power for a fraction of the cost and waste. The ball contains dozens of smaller ceramic balls that agitate your wash and keep your laundry water's ph level neutral. They sanitize, soften fabric, use non-toxic earth-friendly materials, and save hundreds of dollars on detergent in the long run. Since no detergents, perfumes, dyes or oils are used, no rinse cycle is necessary thus shortening your wash time and electricity used. It takes a bit of a leap of faith to initially try a laundry ball, but take it from me, they do work and it is very nice to not need to purchase laundry detergent! We recommend the Super Wash Ball+ from www.reuseit.com. 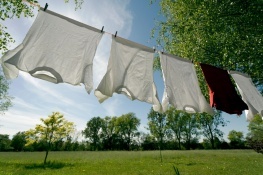 Another great way to save electricity and money is to line dry your clothes. This option has the biggest hit to your lifestyle as it is so much quicker to throw your clothes in the dryer than to hang them on a line or on a drying rack. But, this change will result in a significant reduction in electricity usage and will reduce your monthly utility bill. Niagra Conservation estimates that the average American family dries 5 loads of laundry each week which uses 100 kWh of electricity. That usage results in 5200 kWh of electricity in a year. Take a look at your utility bill and see how this compares to what you pay each month and what your personal savings might be. Not ready to put up a clothes line in your backyard (or if due to neighborhood/ building restrictions you cannot)? Start smaller with at least two drying racks. If you have several loads to do you can use the drying rack for smaller items like underwear and socks. These will dry quickly even when inside. Larger items like pants and towels can stay in the dryer. Hang the small items on your drying rack and leave the bigger items in the dryer until you have finished a second load of laundry so you can fill up the dryer. When you do use your dryer, remember to clean out the lint filter after each load to maximize the dryer’s efficiency. And if you use dryer sheets, look for ‘green’ options from Seventh Generation or other similar companies. Or better yet, purchase reusable dryer balls. Besides helping to soften clothes, these also help speed the drying time by lifting and separating clothes. Use an Energy Star (www.energystar.gov) washer and dryer. Use the ‘Cold’ water option on your washer. Purchase a laundry ball and get rid of your laundry detergent. If you are not ready to do this, buy a plant based detergent. Ditch your dryer and line-dry your clothes.